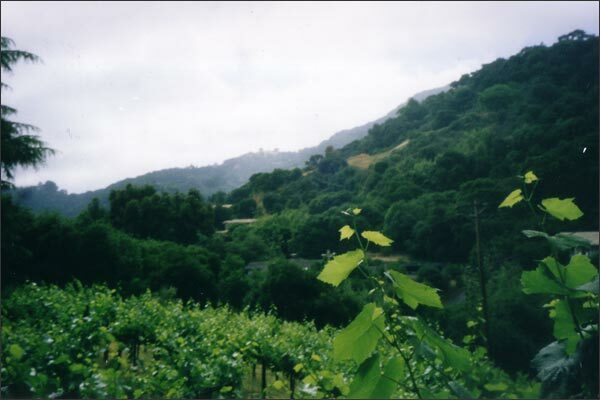 Dry Creek Valley, Healdsburg, CA We strive to create hand crafted wines that express both the characteristics of our land, as well as our stylistic preferences. We hope that our wines accurately represent the unique flavors and attributes of the Dry Creek bench on which we live. If you enjoy our wines and plan on traveling to the beautiful Sonoma County Wine Region, please contact us to visit our property and sample the newest releases. to inquire about up to date price quotes. Wine Club Members: You're entitled to a 20% discount on all wines except Library. Please email us at info@moniclairevineyards.com or call the winery at (707) 433-4320 to order. You can purchase our wines on-line using PayPal by clicking the Buy Now buttons below. we may adjust your remittance in order to reflect our final packaging costs. Pleasantly aromatic with peach and pineapple notes, an exotic bouquet. Our Musque clone Sauvignon Blanc shows tropical fruit, and the flavors are fresh and crisp. The finish is a touch spicy and backed with mild acidity. This is a white wine to enjoy on its own or with grilled seafood. Bright aromas of strawberry, orange, rose petals, and spice. Full flavors of dried raspberry and cherry with a hint of white pepper. Refreshing, clean and crisp with a delicate berry finish. Our Dry Rosé is made to be enjoyed anytime you would like a refreshing, fruity glass of wine. Classic Dry Creek Valley Zinfandel with aromas of red and black berries with a touch of warm baking spices. The concentrated flavors of raspberry and blackberry combine with vanilla, toasty oak, pepper and a dash of nutmeg. The spicy-berry dynamic so typical of Dry Creek Zin combines smooth tannins and a spicy finish which are a hallmark of our land. This is a rich and full bodied Zinfandel with a lingering finish and well balanced between fruit and tannins Drink now or cellar for five to eight years. The garnet color of this wine shows the concentration of the vintage. Aromas of ripe berries mingle with hints of black pepper, cinnamon and toasty oak. Rich flavors of blackberry, plums, touch of caramel, and framed by the unique mocha flavors of our Barnside Vineyard. Enjoy now or anytime over the next six years. Deep dark purple in the glass. Our rich, full bodied Petite Sirah offers aromas of blueberries, black plum and pepper. Very deep and complex flavors of blueberry, black cherry, pepper spice, vanilla and toasted oak. There is nothing ‘petite’ about this wine and it is well structured with firm tannins and a smoky finish. It has the structure to age well over many years. Beginning with the bouquet, intense blackberry fruit aromas, cola and cassis jam followed by a touch of vanilla and tobacco accented with hints of earth. The wine is richly textured and balanced with a beautiful brightness. Flavors of black cherry, tobacco and sweet barrel caramel shine throughout. Soft tannins round out the lingering, smooth finish. Luscious and dark with incredible viscosity and mouth feel. Rich plum, vanilla and blackberry dominate the front palate while mocha and chocolate fan out over mid-palate and finish. This wine has elegant grip and a sense of texture and traction that grabs your palate and gives the other flavors in the wine exceptional balance. This results from the wine's complex structure of acid and tannins. Opaque and black purple in color, full bodied and powerful, offering a rich bouquet of blueberries, earth and plum, mingled with the familiar MoniClaire cocoa. Seasoned for 14 months in French oak, a subtle mixture of vanilla accentuates the forward fruit flavors. It is both big and elegant on the palate and offers a velvety mouth feel with a long satisfying and complex finish. It is ready to drink now or over the next 7 to 10 years. This is a wine that will age beautifully and continue to develop more of that earthy cocoa flavor. This wine will pair marvelously with grilled meats and powerful cheeses. If you enjoy Petite Sirah, you will love this wine. We can make arrangements (via phone 707 433-4320) to accept checks for payment.